Size: 6" x 6" x 2"
Use 5S Corners to assist with organizational efforts by marking the locations where pallets, machinery, and other equipment should be placed. These corners are great for 5S and Lean programs that focus on using space effectively and for keeping spaces organized. 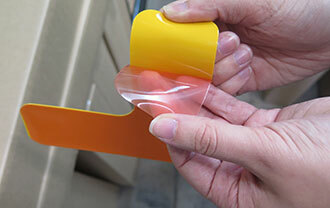 They are made using a high-quality, industrial vinyl material so they can withstand forklift and truck traffic. They will also hold up to water, chemicals, and UV rays. These corners are easy to install, so you won’t need to worry about downtime during installation. 5S Corners also have a low profile so they won’t interfere with your facility’s operations. 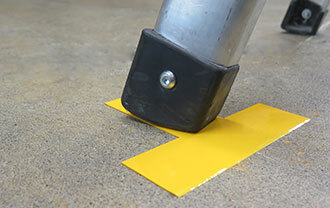 Floor marking shapes sit smoothly on floors and won’t snag or cause tripping. Just peel off the backing and stick the shape to a clean, dry surface. 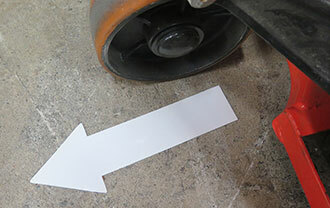 Floor marking shapes can hold up to heavy foot and vehicle traffic. I just placed my third order this month and the 5s corners are great. Also, the candy is sweet! We had a bunch of symmetrical lines to connect in our factory, and these were great and held up to lots of equipment rolling over it. Nice folks there at Creative Safety, too. Helped me figure out the right ones to get. Really, you can't beat these corners. We tested a number of other corners and these have been the best. These are great for marking off pallet locations, we use these along with the T's and X's to mark multiple pallet locations in our shipping/receiving area. The hold up really well to all of the forklift and pallet jack traffic. We used to make our corners by splicing the perpendicular lines together, then trimming the excess. It looked good, but it took time to do it, and when you have a quarter mile of taping to do, these corners are faster to apply. We still need to splice for angles other than 90 degrees though.